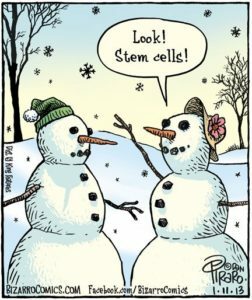 This cartoon revealed snowmen receiving their stem cells (snow). The point should not be lost. 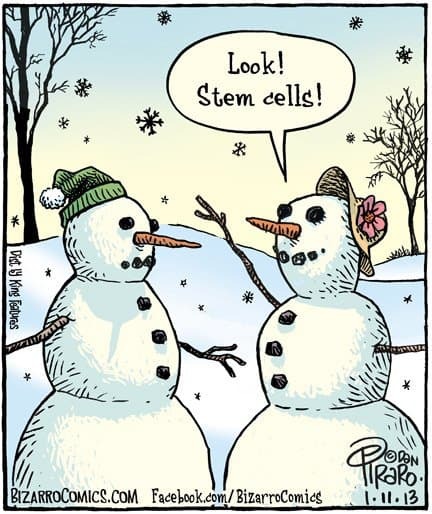 Stem cells are repair cells. They function to promote healing and restore tissue to a normal state. 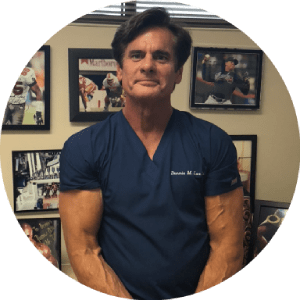 Stem cells are inherent for our bodies ability to repair from injury and to protect the surrounding environment for the cell, known as the cell niche. This is extremely important for musculoskeletal joint functioning. Our bodies joint have a diminished capacity for repair as we age, and thus have a limited supply of stem cells. The joints are also mostly without a blood supply that may provide repair nutrients further impairing tissue repair and recovery. Lacking reparative ability, our joints degenerate or become arthritic. Fortunately, stem cells may now be directly placed into our joints for enhanced repair and regenerative potential. Stem cells that our found in more plentiful areas of our body may be transplanted easily in an office practice the same day into a joint in need of help. This is where the snowmen analogy, is relevant. If the snowmen do not receive assistance in the form of outside snow they can not be repaired when they begin to melt. Similarly, joints in need of assistance are not able to restore themselves without aid from the stem cells brought in, as the joint does not have the stem cells to repair itself. Building up the joint or preventing further joint breakdown is also a form of rebuilding as the surrounding tissue is repaired. Stem cells orchestrate and direct this form of repair. Commonly affected joints such as the knee, hip, shoulder, and spine may be treated in this fashion. Then future of Regenerative Medicine will look at correcting the joint involvement at early stages and possibly rendering joint replacement surgery as obsolete. The use of Stem Cell Therapy for joint problems is an exciting new field of therapeutics for Regenerative Medicine.